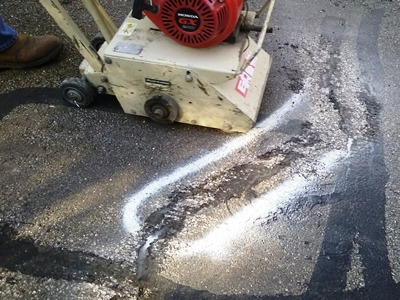 The trail is smoother and safer after a team of 7 FLMSP volunteers ground down bumps in the asphalt using a rented walk-behind scarifier at the end of October. A total of 144 bumps were located and marked earlier in the month. This was a significant reduction from the 280 bumps treated in 2015. Don Hahn, who has monitored trail bumps for several years, attributes the fewer bumps primarily to the root cutting done two years ago that used a tractor-mounted blade to cut tree roots along the trail edge. The worst asphalt bumps, not surprisingly, are next to trees growing within 5 feet of the trail edge; these trees should be removed. 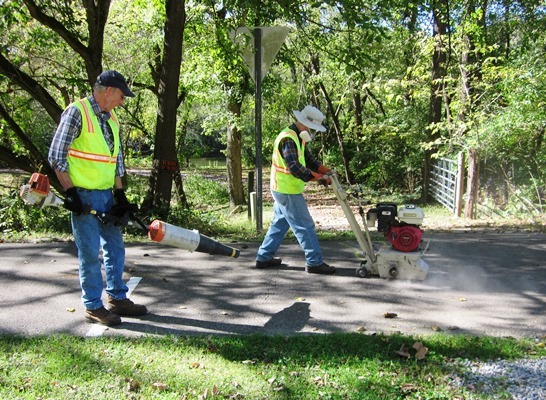 Don Hahn (pictured left) has diligently catalogued and monitored every bump on the park’s 50 miles of trail, and has documented guidelines for the bump-grinding process and recommendations for treating and preventing future bumps. 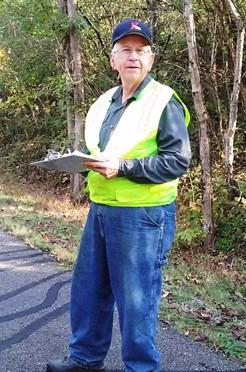 Thank you, Don, for your comprehensive work on this important trail issue. We thank all the volunteers who logged 160 hours in this year’s bump-grinding effort that has smoothed our way into 2018. Below: Michael Hayden (right) operates the scarifier while Jim Risbeck uses a blower to clear the debris.